There are many tools on the market that promise to boost your sales team’s performance. They offer a variety of approaches to “helping” Sales do a better job. In fact, the whole notion of sales performance management software has a long and not always positive history. Some sales tools promise to boost sales team motivation while others measure sales productivity and provide a selection of sales enablement tools to deliver individualised sales team support. Some of these technologies have little to do with the mechanics of selling and concentrate on increasing accessibility to customer and prospect data in an effort to help Sales identify qualified prospects more efficiently. It is not surprising that sales teams are frequently somewhat skeptical of the efficacy of the proposed solution. This skepticism may also extend beyond the technical aspects of the solution and include some mistrust of the true motivations of those who are proposing the solution. The perception may well be that these solutions are intrusive and aimed at exposing poor work habits rather than helping the sales team grow revenue. So, even if you are completely won over by the promises of CPQ, your finance group is enthusiastically supporting you and your C-level management is urging you forward, don’t be surprised if your sales team is not jumping for joy when you decide to bring in a suite of CPQ tools. While this is not always the case, you are probably going to have to sell Sales on a new CPQ system. You are telling me how to do my job. I have enough on my plate; more opportunities are not needed. I know where to go to get answers. I don’t have time to learn a new system. You need to organise a Selling Sales Campaign. Before you proscribe a solution, it is best to first establish the nature of the problem to be solved. If your only selling point to Sales is a promise of improved margin, you will not likely get your team onboard with the program. You have to show your team where the performance is currently and where it should be after implementing CPQ. Go into your selling mode with a few well-chosen metrics that will help you build your case with the team. You don’t need 25 different graphs or charts; you just need a couple of metrics to cite. These should be explained, and at the same time, so should the expected impact of CPQ. Customer inquiry to response time – CPQ will provide easy, on-the-spot access to answers to virtually any early cycle question a prospect may have. There will be no need to seek out and find the expert to answer the prospect’s questions. Quote-to-cash interval – Throughout the entire buying cycle, CPQ will help you reduce response time to customer questions and inquiries. Early, mid- or late-stage issues with pricing, product configuration or proposed business terms and conditions can be quickly and accurately answered. This reduces lead and sales cycle time overall. Lead conversion to opportunity percentage – Leads often languish in the funnel because of issues, objections and obstacles brought up by the prospect that are not easily understood or answered. Expert input might be required from Engineering or Product Management. During the wait for answers, more issues are exposed and more time is required to address those issues. CPQ places expert knowledge into the hands of the sales rep allowing them to handle virtually any objection or questions immediately. Legitimate disqualifications are identified and handled quickly, and opportunities are elevated quickly as well—things don’t get lost. These three elements are specific things that CPQ can address and improve. The positive impact of CPQ on the selling process itself is obvious and should be welcomed. But, you will still need to close the deal. Once Sales understands the beneficial effect of CPQ, other benefits can be discussed as well. A role-based CPQ solution is best discussed with each individual role involved. Pre-Sales, Sales Management and Post-Sales Support all will realize unique benefits within the CPQ solution. Pre-Sales will find the interactive interview feature within CPQ to be helpful in isolating the prospect’s specific issues and pains. Sales will appreciate the ability to easily reconfigure the solution with various options for the prospect to consider and the automatic, on the fly, regeneration of pricing for each option. The visual product catalog will help the prospect understand and see exactly what is being proposed. Better and faster understanding of the proposed solution means increased speed to quote and close. Post-Sales reps will find great benefit in the ability to identify cross- and upselling opportunities once your solution is implemented and delivering value to your customer. CPQ facilitates building trust with buyers, and that facilitates add-on business down the road. Sales Management will love the virtual elimination of manual entry errors for sales orders. Accurate pricing and bills of material (BOMs) will automatically populate your order forms. 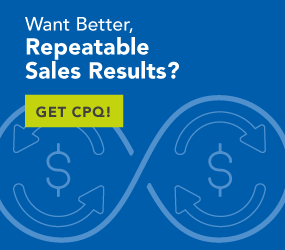 CPQ also reduces the new sales rep’s learning curve because they can concentrate on learning about business value and spend less time memorizing esoteric product specifications and line-item prices. Seeing the potential increase in profit-per-sale is easier than seeing your sales team jump all over your CPQ solution. An easy way to establish credibility with Sales is to select a new hire and bring them online with CPQ. Alternatively, if you have a team player in your sales organization, recruit them to be a CPQ pilot. Champion users who will champion your CPQ implementation are the most effective help you can get for selling sales. Just like user stories and customer references that are so beneficial in selling to customers, champion users will give CPQ much greater credibility than upfront promises ever will. CPQ benefits everyone—Sales, the customer and management. Many sales reps will embrace it from the beginning, but some will need convincing. Organising a Selling Sales Campaign is a great way to get your team on board.